Harris Hawk - Raptor Rehabilitation of Kentucky, Inc. 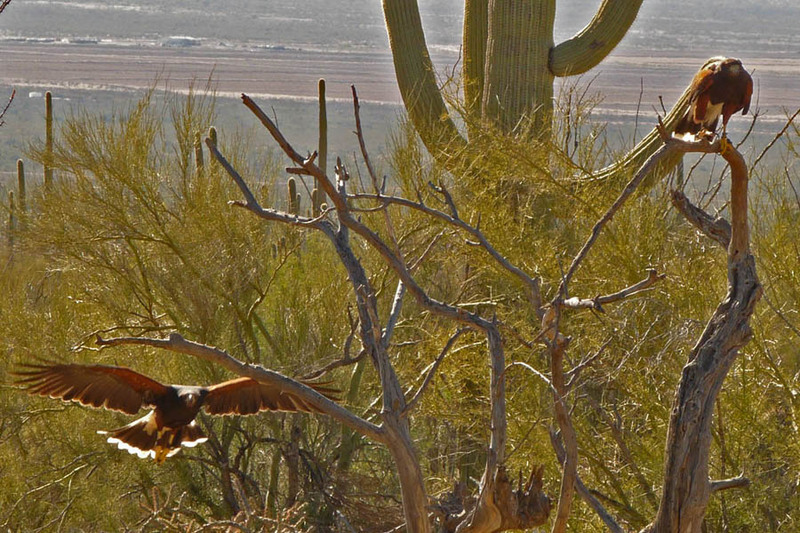 The Harris' Hawk is not found in Kentucky, but is native to the southwest region of the U.S, including Texas, New Mexico, Arizona and southern California. They prefer upland deserts dominated by saguaro cacti, arid mesquite and paloverde woodlands, or some juniper-oak habitat. Harris' Hawks are extremely social raptors, and they are the only cooperative nesting raptor in North American. Individual breeding groups reside in and defend breeding territories. One alpha female forms a group with several males, and immature birds from previous clutches. All bring food back to the nest, resulting in a higher success rate for raising young. In most cases, only the alpha male and female feed and brood the young. They often hunt cooperatively as well, using a flush and ambush, surprise pounces and relay attack methods. Kills are shared among the entire nesting group. As a result, Harris' Hawks are called the lions of the desert and resemble a pack of lions crowding around the kill to get their share. In winter, they perch in groups of up to a dozen. Sometimes, due to lack of perching space in the desert, they stand on another bird's shoulders, stacking 5-7 birds high in a cheerleader-like fashion. Their numbers are declining due to urban sprawl reducing their habitat.